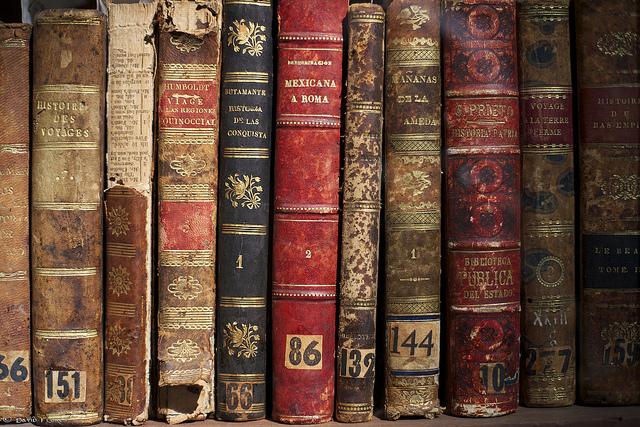 By ‘monastic libraries’ we really mean the collections of books in the religious houses. The essential point is not that monastery means ‘a community of monks’, and is therefore narrower in application than ‘religious house’, but that ‘the monastic library was not a library at all, if by a library is understood a building housing a collection of books ‘ (David Knowles). Before the Norman conquest, monasteries were comparatively few in England and their development was hindered by the Danish invaders who frequently plundered the monasteries and sometimes killed the monks. The early libraries founded at Jarrow and Wearmouth in the seventh century and at York in the eighth century were outstanding in their day, but they did not survive very long. Although, after the Norman conquest, monasteries increased both in numbers and in wealth, their book collections grew very slowly. Most houses were small and so had neither the need nor the means to acquire many books. By the dissolution, even the libraries of the larger houses were small by modern standards. 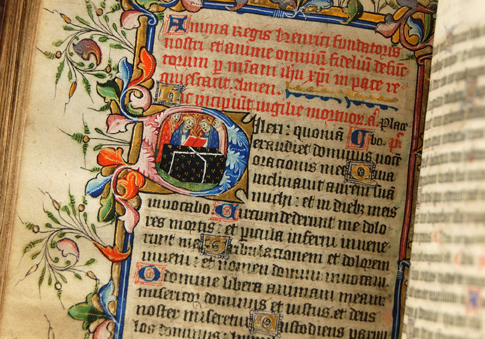 To a medieval monastery a mere 1000 volumes (which meant rather more than 1,000 titles) was a substantial collection. The nucleus of a monastic library was the necessary service books and the scriptures. To these were added books for teaching, practical works on law, medicine and husbandry and books for devotional purposes. The collections grew in three ways: by copying books borrowed from other houses, by occasional purchases and by gifts and bequests. The most substantial acquisitions were most likely to come by gift. The growth of a monastic library was haphazard. Dr. Savage said that the spirit of modern librarianship is first traceable in the monasteries, particularly in the libraries of the larger houses such as Canterbury, Dover, Bury St Edmunds and Syon. But even in these houses the library economy was simple. The traditional design of a monastery did not allow for any particular accommodation for books. Those not in use were mostly kept in the cloister, in chests, presses or wall-cupboards. Several of the larger houses eventually built book rooms, but the first of these did not appear until the beginning of the fifteenth century. The duties of librarian were performed by the precentor, whose particular concern was to see that the books were not damaged or lost. 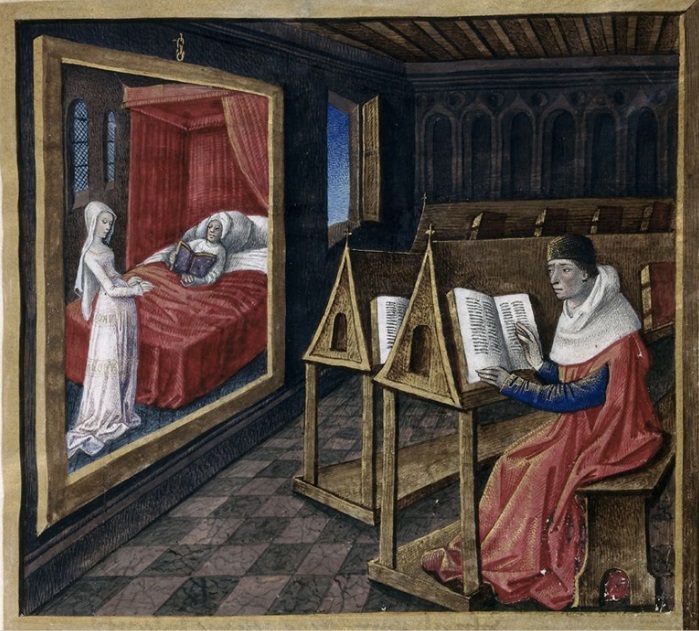 Librarianship in the medieval monasteries was librarianship in slow motion. The loan of books within a monastery was commonly an annual procedure and, as far as we know, books were seldom lent outside. J W Clark’s observation that the monastic libraries were ‘the public libraries of the Middle Ages’ has often been quoted, but Clark was speaking of European monasteries generally and not of the English monasteries specifically (J W Clark The care of books 55, 64). Kelly has discussed, at length, how far the English monastic libraries were accessible to the public. He concludes that although books were occasionally lent to outsiders and were ‘reasonably accessible for purposes of reference’, few laymen were either able or willing to make use of them. The end of the eleventh century saw the foundation of the first of several new religious orders, which soon established houses in this country. Among these reformed orders, the Cistercian order is of special interest, as the Cistercians are supposed to have paid particular attention to the problem of housing books. In the thirteenth century, the pioneer mendicant orders came to England, the Dominicans in 1221 and the Franciscans in 1224. 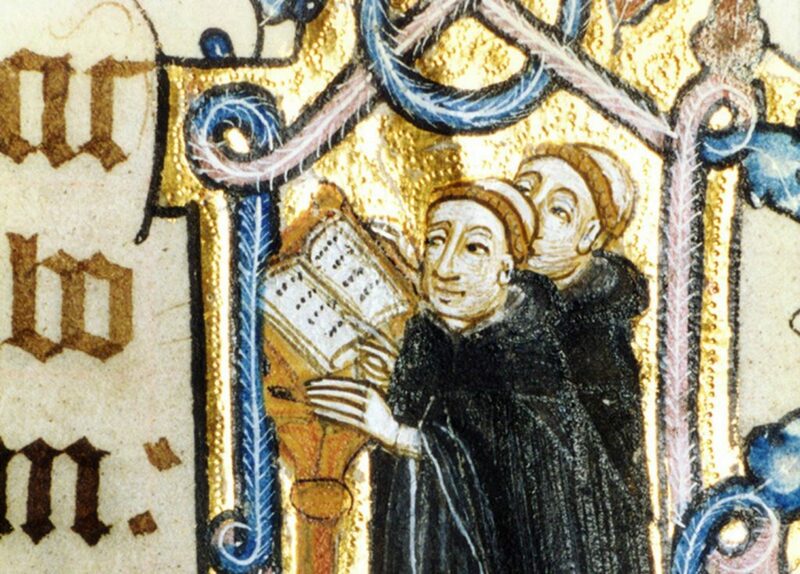 The friars were dedicated to poverty, but to sustain their work of teaching and preaching they soon found it necessary to erect their own conventual buildings and to provide themselves with their own collections of books. In the fourteenth century, Richard de Bury, in his Philobiblon, accused the friars of being zealous book collectors, but K W Humphreys, who has recently made an intensive study of the book collections of the friars, says that ‘The collections of books were not made in any spirit of covetous-ness or pride in accumulation, but for the equipment of the friars in their studies’ (The book provisions of the mediaeval friars 89). The Franciscans found a staunch patron in Robert Grosseteste, Bishop of Lincoln. ‘It was largely his influence that guided them forward from their founder’s rejection of learning and books into the paths of academic studies’ and encouraged them to collect books (Irwin). After about a hundred years the friars lost their popularity with the people, but by that time they had achieved great influence at the new universities, especially at Oxford (see The heritage of the English library chapter IX). The dissolution of the monasteries (1536-1540), when about 800 houses were suppressed, led to the wanton dispersal of their books. The patient labours of modern scholars (notably the late Dr M R James) have shown that the number of books destroyed was not altogether so great as was once supposed, but the proportion of books lost from some houses was much greater than from others. Thus, 56o volumes survive from the library of the Cathedral Priory of Durham, but only fifteen volumes from the large library of Leicester Abbey. 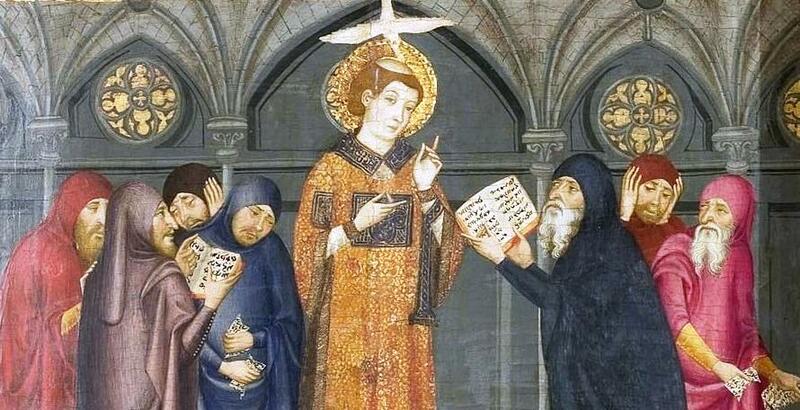 As the monastic libraries were ‘special libraries’ rather than public libraries’, few laymen regretted their passing. When the monasteries were dissolved in France, at the end of the eighteenth century, special pains were taken to secure the books for the benefit of the national library and various local libraries. Although Henry VIII was advised to enrich the Royal Library with monastic books, not many were acquired. Fortunately, it was still possible, later in the century, for several private collectors to obtain monastic volumes of unique interest, books which eventually found a permanent home in the libraries of Oxford and Cambridge and the British Museum Library. 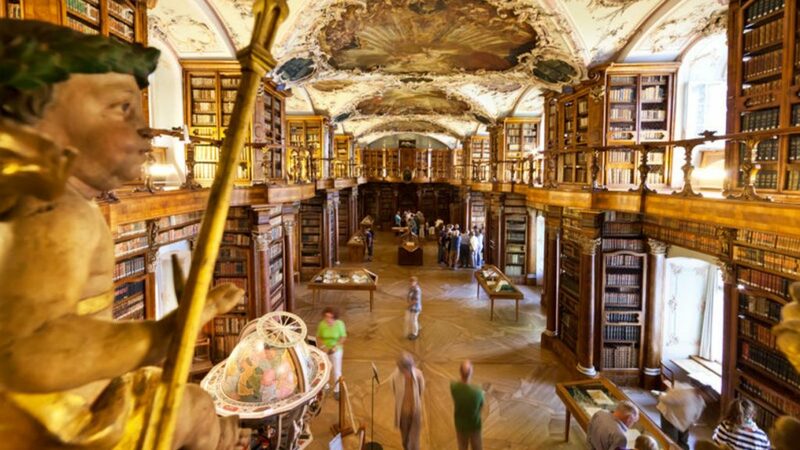 The monastic libraries having been dispersed, the future of librarianship lay with other institutional libraries and increasingly with libraries of printed books. Not many printed books were acquired by the monasteries. An interesting exception is the library of the solitary English house of the Bridgettines, at Syon, founded in 1415. It is unlikely that much more will be discovered about the English monastic libraries, and we are badly in need of a new monograph on them. Ernest A Savage Old English libraries (Methuen, 1911; reprinted Gale Research Company, 1968) is still of some value, as David Knowles acknowledges, but it is a difficult book for students without any previous knowledge of the subject. The most useful introductory readings are Francis Wormald and C E Wright (eds) The English library before 1700 (University of London Athlone Press, 1958) chapters II, V and VIII, and the chapters on the monastic libraries in the standard works on English monasticism by David Knowles, namely, The monastic order in England (cm), 1940) 522-527 and The religious orders in England vol II (cup, 1955) 331-353. See also Thomas Kelly Early public libraries chapters I and II and Raymond Irwin The heritage of the English library chapter VIII and The English library chapters VI, VII and VIII. Until recent years, little work had been done on the libraries of the friars, and convenient readings on this subject are few. The most important study is K W Humphreys The book provisions of the mediaeval friars 1215-140o (Amsterdam, Erasmus Booksellers, 1964), but the references to the English libraries of the mendicants are scattered. Irwin’s essay ‘S. Robert of Lincoln and the Oxford Greyfriars’ will be found in The heritage of the English library chapter IX. Not many catalogues of monastic libraries have survived. Good examples of those which have been transcribed and published are M R James The ancient libraries of Canterbury and Dover (CUP, 1903) and Mary Bateson Catalogue of the library of Syon monastery (CUP, 1898). N R Ker Medieval, libraries of Great Britain (Royal Historical Society, second edition 1964) is a location list of surviving monastic books, with an informative preface. 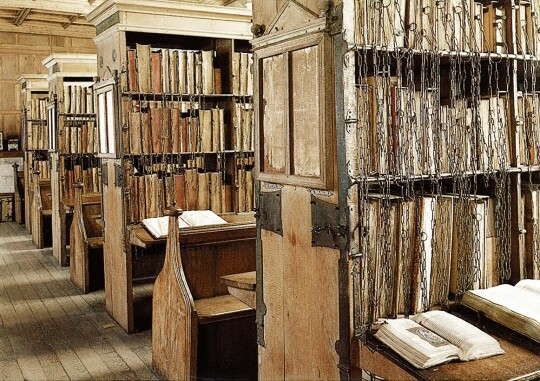 The story of the monastic libraries of Britain is part of the medieval library history of Europe. See J W Thompson The medieval library (University of Chicago Press, 1939; reprinted Hafner 1957). 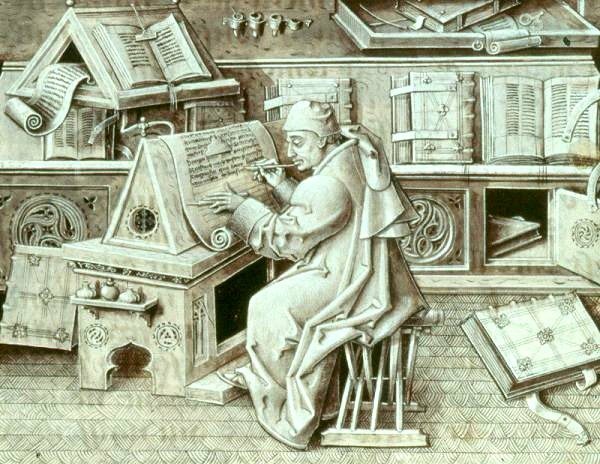 In the latter part of the middle ages, the practice of chaining books became common. As Canon Streeter has said, this is not ‘an interesting irrelevance’ in library history, but an important matter for consideration, as the chaining of books dominated library design for many years. After the dissolution, books were chained in the cathedral libraries and in the university and college libraries of Oxford and Cambridge. At Oxford, some libraries were still using chains in the eighteenth century. The standard treatise on this subject is B H Streeter The chained library (Macmillan, 1931), a splendidly illustrated volume inspired by the author’s labours on the restoration of the famous chained library at Hereford Cathedral. See also Wormald and Wright chapter XI, which discusses the use of chains at Oxford.